Hi welcome to my website, I'm 36 years old and live in the south of The Netherlands. As you can see on the map, one of the worst places on Earth to do astrophotography because of light-pollution, air pollution, cloudy weather and so on. My setup is located in the black circle. In 2006 I got my Bachelor of Engineering degree and started my software development career, and at this moment I'm still active in software consultancy. My interest in astronomy started in my childhood when I was nine years old (1991). I regulary went to a local observatory and I had two simple toy refractors. I was able to see craters on the Moon, Jupiter, phases of Venus and even Mars and Saturn. But I was particularly fascinated by deep sky objects like nebulae, galaxies and clusters, but my telescopes were too small to really make that visible. I couldn't afford a big newtonian and so my interest in astronomy became less. 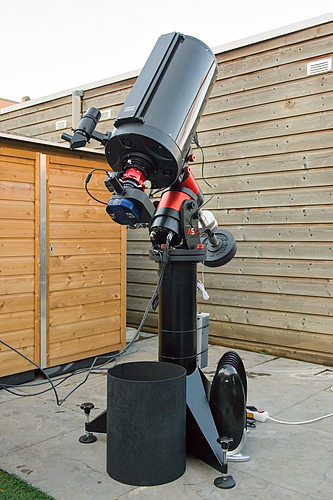 In 2009 the interest started to grow again and I decided to buy a 8" newtonian starterset. I also had a DSLR and I made some photos through the telescope, from that moment I was hooked. The combination astronomy, photography and software enabled me to take photos of deep sky objects. I learned a lot in a short period and also upgraded and automated my equipment. At this moment I have a 10" carbon fiber Ritchey-Chrétien telescope on a ASA Direct Drive German Equatorial Mount, a QSI 683wsg cooled CCD with 8 Astrodon filters; broadband and 3nm narrowband. In 2013 I had the opportunity to join a group of enthousiastic astrophotographers, and share a setup at a remote location in France, Hautes-Alpes (www.sunstarfrance.com) with much better atmosferic conditions. Astrophotography is a specialized type of photography that entails recording images of astronomical objects. Besides being able to record the details of extended objects such as the Moon, Sun, and planets, astrophotography has the ability to image objects invisible to the human eye such as nebulae and galaxies. This is done by long time exposure since digital cameras can accumulate and sum light photons over these long periods of time. In professional astronomical research photography revolutionized the field, with long time exposures recording hundreds of thousands of new stars and nebulae that were invisible to the human eye, leading to specialized and ever larger optical telescopes that were essentially big cameras designed to collect light. 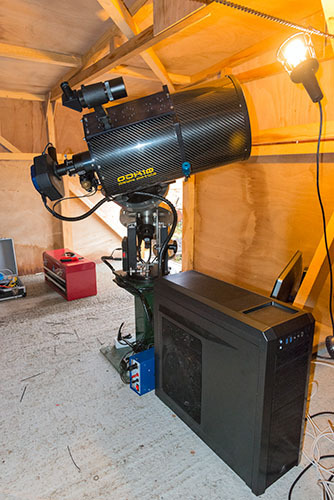 Direct astrophotography had an early role in sky surveys and star classification but over time it has given way to more sophisticated equipment and techniques designed for specific fields of scientific research, with astronomical CCD cameras becoming just one of many forms of sensor. Astrophotography is a large sub-discipline in amateur astronomy where it is usually used to record aesthetically pleasing images, rather than for scientific research, with a whole range of equipment and techniques dedicated to the activity. With only a few exceptions, astronomical photography employs long exposures since imaging devices can accumulate and sum light photons over long periods of time. The amount of light hitting the detector is also increased by increasing the diameter of the primary optics (the objective) being used. 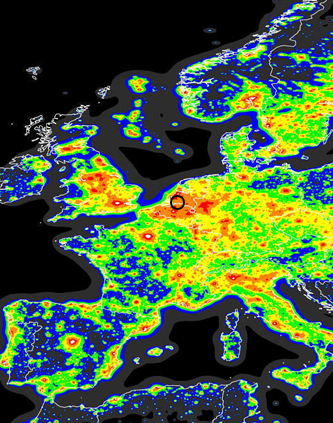 Urban areas (like The Netherlands) produce light pollution so equipment and observatories doing astronomical imaging are located in remote locations to allow long exposures without the detectors being swamped with stray light. Since the Earth is constantly rotating, telescopes and equipment have to be rotated in the opposite direction to follow the apparent motion of the stars overhead (called diurnal motion). This is accomplished by using either equatorial or computer controlled altazimuth mounts to keep celestial objects centered while the earth rotates. 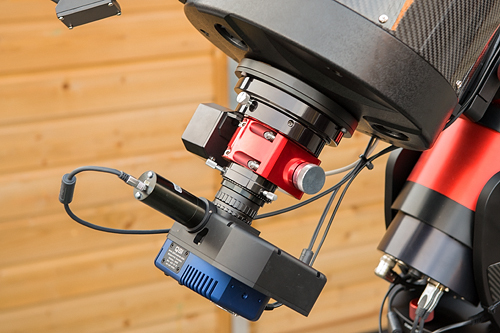 All telescope mount systems suffer from induced tracking error due to imperfect motor drives and mechanical sag of the telescope. Tracking errors are corrected by keeping a selected aiming point, usually a bright guide star, centered during the entire exposure. Sometimes (as in the case of comets) the object to be imaged is moving, so the telescope has to be kept constantly centered on that object. This guiding is done through a second co-mounted telescope called a "guide scope" or via some type of "off-axis guider", a device with a prism or optical beam splitter that allows the observer to view the same image in the telescope that is taking the picture. Guiding was formerly done manually throughout the exposure with an observer standing at (or riding inside) the telescope making corrections to keep a cross hair on the guide star. Since the advent of computer controlled systems this is accomplished by an automated systems in professional and even amateur equipment. Astronomical CCD cameras may use cryogenic cooling to reduce thermal noise and to allow the detector to record images in other spectra such as in infrared astronomy. Specialized filters are also used to record images in specific wavelengths. Astrophotography is a popular hobby among photographers and amateur astronomers. Images of the night sky can be obtained with the most basic cameras. For simple star trails, no equipment may be necessary other than common tripods. There is a wide range of commercial equipment geared toward basic and advanced astrophotography.